Japan has come to dominate the market for digital currency trading. Still, it is far more cash dependent than other countries. Japanese investors are going bananas for cryptocurrencies, but the country still has a love affair with paper money. 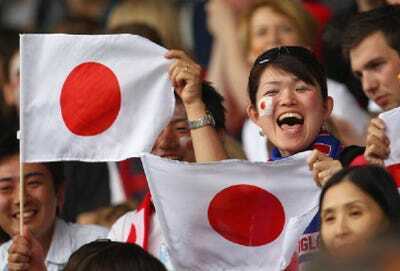 Japan has become a big market for cryptocurrency trading. 40% of bitcoin trading from October to November was conducted in yen, according to a Nikkei report cited in a note by Masao Muraki, a global financial strategist at Deutsche Bank. The country was among the first to designate bitcoin as a legal tender and it has one of the most well-established and supportive regulatory environments for cryptocurrencies. But that doesn’t mean the country has thrown paper money to the dogs, according to Smith. On the contrary, Japan is one of the most cash-dependent nations in the world. 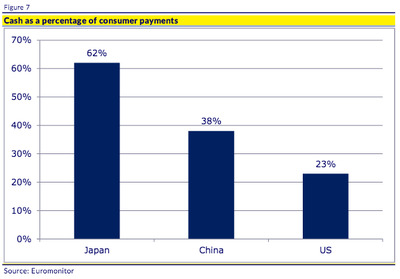 “For all its technological sophistication, Japan is decidedly olde worlde in its heavy dependence on cash, at 62% of consumer transactions -almost triple the US,” Smith wrote. The reason the country is so cash-centric is because there is a profusion of ATM machine and bank branches, relative to other countries. However, this could mean that there is still a big upside for further digital currency and financial technology adoption in the country. Fintech adoption has been a focal point of Japanese Prime Minister Shinzo Abe’s economic plan. As Business Insider previously reported, his government was moving forward with a plan to roll back regulations on some fintech startups to help spur the development of emerging technology and drive growth in the country. “When one wants to conduct a world-first trial, such as with new financial services made possible through fintech, it is impossible to predict the sort of regulations with which the trial will come into conflict,” Abe said speaking at the New York Stock Exchange in September.